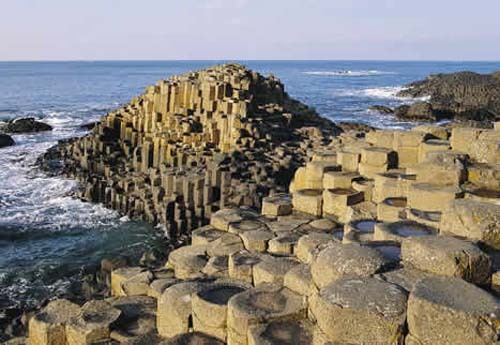 World Heritage Site with strangely regular basalt rock formations, Giant's Causeway become one of the top tourist attractions in Ireland you must visit. It's Formed of a volcanic eruption 60 million years ago, this is the focal point of a designated Area of Outstanding Natural Beauty and has attracted visitors for centuries. It harbours a wealth of local and natural history. How did the Giant's Causeway come to be? It is a question that has stirred debate for centuries. 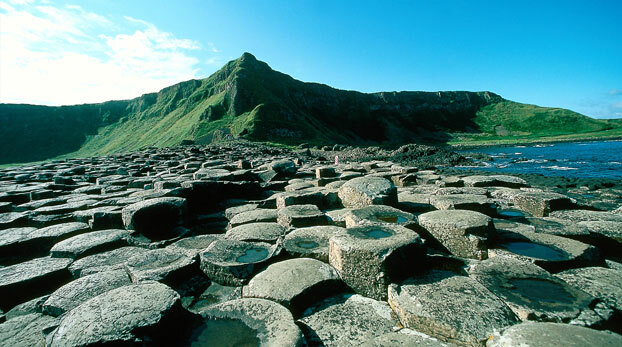 Legend has it that the giant Finn McCool fashioned the Giant's Causeway so he could walk across the sea to Scotland and face Benandonner, his great rival. But according to the scientist say that Giant's Causeway was due to intense volcanic activity. Lava welling up through fissures in the chalk bed formed a "lava plateau". Three periods of volcanic activity gave rise to the Lower, Middle and Upper Basalts, and it's the Middle Basalt rock which forms the famous amphitheatres of hexagonal columns in the Causeway. Weathered formations have created circular structures round a core of basalt which are known locally as "giant's eyes". Some other formations with popular names are the Chimney Stacks, The Harp, The Organ and the Camel's Hump. If you want to experience one of nature's true wonders in Ireland make sure to visit the Giant's Causeway. Giant's Causeway, located in an Area of Outstanding Natural Beauty, is a haven for walkers and birdwatchers alike. Sea birds can be seen off the coast around the Causeway, with species such as fulmar, petrel, cormorant, shag, redshank guillemot and razorbill being frequently observed. Rare and unusual plant species including sea spleenwort, hare's foot trefoil, vernal squill, sea fescue and frog orchid can be found on the cliffs and nearby rock formations. If you interesting to walk around you can join to enjoy experience North Antrim's spectacular coastline first hand by taking a walk along the coastal path which extends for 12 miles from the Giant's Causeway to the Carrick-a-Rede Rope Bridge.